The Antichrist is not a future leader like Left Behind's Nicolae Carpathia; rather, the Antichrist came to power long ago when the Roman Empire, which was restraining it, got out of the way. "Lyke as Mahomet saith ty his Alcoran is ye soveraine wisdome, so saith the Pope of his owne decrees: For they be the two hornes of Antichrist." 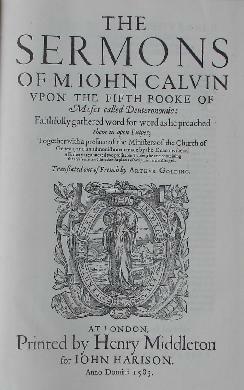 The Sermons of M. John Calvin upon the Fifth Booke of Moses called Deuteronomie, translated by Arthur Golding, first published in London, 1583, from a facsimile reprint by Banner of Truth Trust, 1987. "the Pope is the spirit of antichrist, and the Turk is the flesh of antichrist. They help each other in their murderous work. The latter slaughters bodily by the sword; and the former spiritually by doctrine." "what is the Pope doing? He is sitting not in the natural temple or God's house, but in the spiritual, in the new and living temple of which Paul says: 'If any man destroyeth the temple of God, him shall God destroy; for the temple of God is holy, which temple ye are,' I Cor. 3, 16-17. ... Thus you see whether the Pope is not the greatest arch-abomination of all abominations, to whom Christ and Daniel refer; and the true Antichrist, of whom it is written that he sitteth in the temple of God, among the people, where Christ is named and where his kingdom, spirit, baptism, Word and faith should be...."
The pope sits in the spiritual Temple  the Church  and Islam occupies God's place on Temple Mount in Jerusalem. Commentators today distinguish between "radical" Islam and the Islamic movement in general. Likewise, the papacy has polished its image since the Inquisition when it routinely tortured and killed Bible-readers. But, if the fictional Nicolae Carpathia could hide his evil nature in the novels, how much more can the real Antichrist woo the world with sweet talk and false appearances? If Calvin and Luther are correct in identifying Islam and the papacy as the Antichrist, then it may be dangerous to ignore them and look instead for a future Nicolae Carpathia character, as Left Behind teaches.